From left to right: Mark Bryan, director, U.S. Green Building Council National Capital Region; Katie Cristol, vice chair, Arlington County; Jay Fisette, chair, Arlington County. Arlington, Va. — Arlington County, Va., has been named the first Platinum level community under the U.S. Green Building Council’s (USGBC) newly created LEED for Communities program. The honor acknowledges the county’s long-time commitment to environmental stewardship and community sustainability and its many policies, programs and initiatives to create a more sustainable Arlington. LEED — Leadership in Energy and Environmental Design — is the most widely used green building rating program. USGBC expanded the scope of its standards to incorporate entire communities and cities last year (https://www.usgbc.org/articles/certify-cities-and-communities-leed), enabling Arlington to measure and communicate high performance in key areas, such as human and environmental health. Progress and outcomes are measured using Arc (www.arcskoru.com), a digital platform that benchmarks and tracks performance data at the building, city and community level. Arlington’s Platinum LEED certification recognizes the county’s leadership in creating a sustainable and resilient urban environment that has long-proven success in reducing greenhouse gas emissions, managing stormwater, ensuring economic prosperity and focusing on education, affordable housing, health and safety for residents and businesses. Arlington’s sustainability story began with thoughtful Metrorail planning in the 1960s, followed by the Smart Growth strategies outlined in the General Land Use Plan. The county launched its Arlington Initiative to Rethink Energy (AIRE) effort in 2007. AIRE set a target to reduce Arlington County government’s carbon emissions by 10 percent by 2012, compared to 2000 levels, and achieved it by improving energy efficiency in the county government’s buildings, vehicles and infrastructure and other efforts. The County’s Community Energy Plan (CEP), adopted in 2013, established a goal of reducing greenhouse gas emissions 75 percent by 2050. The CEP is an element of Arlington’s Comprehensive Plan, which sets forth the broad goals and policies of a sustainable community over the next 30 to 40 years. Arlington’s green building policies support the plan’s goals by encouraging the construction of buildings that are energy and water efficient while providing healthy indoor environments. Most recently, the county became the first locality in Virginia to approve an ordinance allowing a Commercial-Property Assessed Clean Energy (C-PACE) program — a public-private partnership to provide affordable, long-term financing for projects to improve the energy or water efficiency of commercial buildings in the county. Open-space planning, solid-waste management, stormwater management, affordable-housing planning and public schools were evaluated by the USGBC for the LEED for Communities Platinum certification. 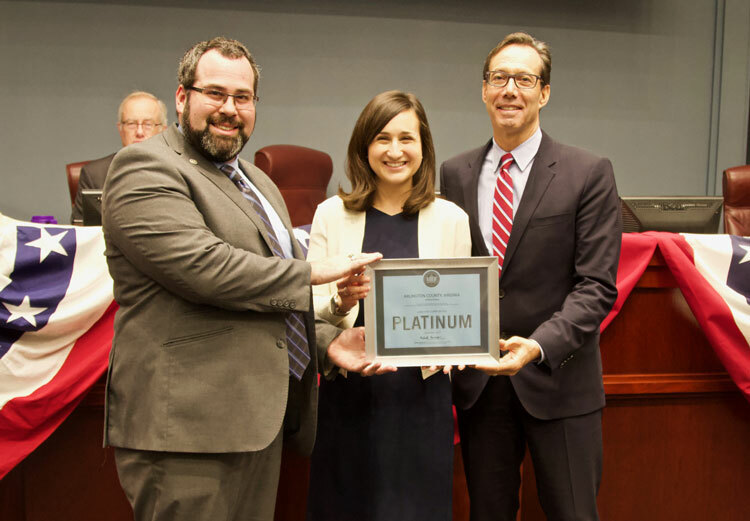 The Arlington County Board celebrated the Platinum certification at its December 19 meeting, which also marked the retirement of sustainability advocate and long-time County Board Member Jay Fisette. “Whether from his bicycle or from the dais of the county board room, Mr. Fisette has championed sustainability in Arlington for the past 20 years. This LEED certification is a tribute to Jay and his now-lasting vision for Arlington’s future,” said Board Vice Chair Katie Cristol. Learn more about Arlington’s energy programs at https://environment.arlingtonva.us/energy.